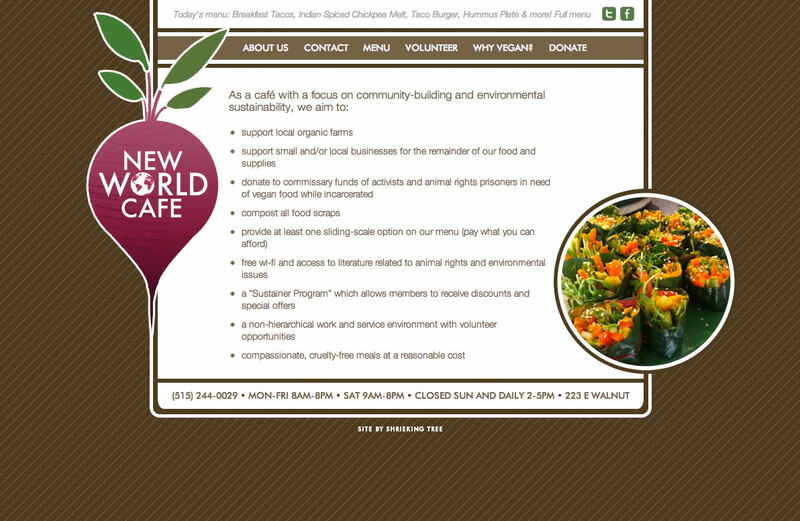 As a small new business, New World Café were in need of a site that was simple, inexpensive, and easy to update. The resulting web site packs a lot of punch for the price, including an effortlessly updatable menu, an integrated Twitter feed at the top, and a minimalist, earth-toned design that lets the food take center stage. When the site was finished, we also designed their large, outdoor sign, and the menus. New World Café is an all-vegan restaurant in Des Moines, Iowa. With an abundance of tasty, made-from-scratch recipes, the owners support local, organic farms, donate to commissary funds of animal rights activists, and compost all of their food scraps. Beyond that, they offer at least one sliding-scale menu option at all times, allowing customers to pay what they can afford, to accommodate those with tight budgets.